Our region forms a biogeographic feature known as the ‘dry corridor’ that adjoins wet tropical bioregions to the north and south and extends the range of fauna and flora more typical of the drier interior to the coast (Kikkawa & Pearce, 1969). 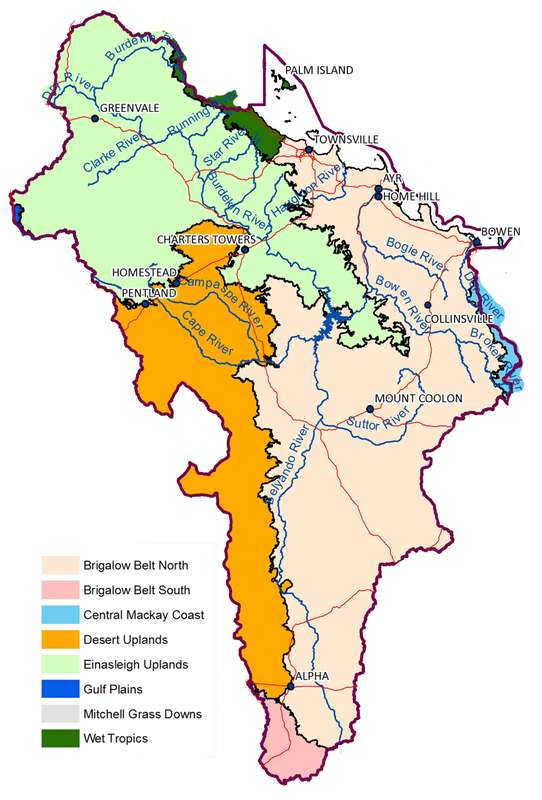 The three main bioregions of our region are the Brigalow Belt North, the Desert Uplands and the Einasleigh Uplands. Portions of the Wet Tropics, Central Queensland Coast, Southern Brigalow Belt and Gulf Plains bioregions also occur within our region (see Figure 15). All of these bioregions are closely associated with a particular combination of geology, landform and soil that supports a very high diversity of regional ecosystems. The terrestrial regional ecosystems span the full suite of tropical biodiversity from inland to the coast. They vary from rangelands (which dominate our region) including open woodlands and grasslands, through to dry coastal areas with open dry forests, rainforests, vine thickets, sedgelands, swamps, coastal dune communities and mangroves. Species that dominate vegetation communities in our region include Eucalypt and Corymbia (Ironbark, Poplar Gum, Moreton Bay Ash, Blue Gum, Bloodwood and Swamp Mahogany), Acacia (Brigalow, Gidgee), Grevillea (Beefwood), Casuarina (She-oak), Melaleuca (Tea trees), rainforest trees and mangroves. Biodiversity values associated with this habitat diversity include recognised centres of species richness and endemism for birds (>300 species), mammals (>70 species), reptiles, amphibians, eucalypts and acacias (Queensland Department of Envionment and Heritage Protectin, 2016). Areas in the Brigalow Belt, Desert Uplands and the Einasleigh Uplands bioregions are identified as National Biodiversity Hotspots as discussed in Flora and Fauna Species Diversity. The relatively small proportion of native habitat conserved in National Parks and other reserves in our region (approx. six per cent) highlights the important role that landholders and the community play in protecting, maintaining and restoring the diversity, extent and condition of our region’s plants, animals and ecosystems. The previous sections highlight strategies to promote and support the community and land managers to restore or maintain the long-term health of our region’s natural resources. Intact ecosystems provide our region and community with resilience in the face of extreme events such as droughts and cyclones. The impact of a rapidly warming climate (Climate Change section) on the region’s ecosystems and on species’ ability to adapt, increases the urgency for governments, communities and land managers to commit to sustainably manage land for protection of species and ecosystem biodiversity. The Nature Refuges program is an example of collaboration between government and land holders to manage land for long-term biodiversity outcomes, including providing habitat for threatened species, movement corridors and refugia for native species, and protecting threatened or poorly represented ecosystems. Scientists have identified that to address climate change, land acquisitions and conservation agreements should be focused in areas resilient to changes such as valleys or elevated areas where animals could survive projected warming (Reside, et al., 2013).